Russian melodic black metallers Skylord from Moscow, will release their debut full-length album “Frostcraft” via SoundAge Productions at the end of winter! 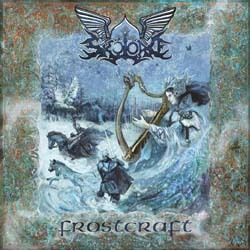 Twelve years after the band’s beginning, ”Frostcraft” was forged with frosty hammers and inflated with snowstorms by Death-Winter’s breath in the harsh fierce coldscapes of Mother Russia. This swift melodious black metal is like a snowstorm, covered with magic gemstone keys, that will swirl you in a dance of snowflakes, fan you with algid winds and put your hearts into the crystals. Raven shrieks of Demether Grail (also in Zmey Gorynich, Arcanorum Astrum, Lunae Ortus, Nimphaion) like a whistle of arrows on the field of ancient battles carry your souls to the ice-bound heaven and blizzard blast-beats of Imidazo (also in Tacit Fury, Todestriebe) shall winter your sense. Pass your way through this Enchanted Forest! Skylord present you the magnificent cover artwork made by the brush of artist Igor “DartGarry” Burlakov (behind which there is just an incredible richly illustrated booklet), as well as the tracklist of “Frostcraft“.